One of my least favorite chores in the kitchen has always been re-filling the built-in hand soap dispenser at my kitchen sink. Through years of extensive research in to this matter, I’ve discovered that I’m not alone. Approximately 57.3% of soap dispensers in the Twin Cities metro area remain unfilled; sitting next to the empty soap dispensers, I often find unsightly store-bought bottles of hand soap. I have many reasons to not refill my soap dispenser. For one, they’re difficult to access. Mine is so tough to get at that I need to lay on my back under the kitchen sink just to unscrew it. They’re difficult to fill. Why are the openings so small?! The photo below shows what used to happen to me every time I would try to fill my dispenser. I’ve tried a funnel, but this doesn’t work either – the soap is too thick. Another problem is getting the dispenser screwed back in place under the counter – it’s very difficult to see under there. I actually installed a fluorescent light inside my kitchen cabinet to help with this chore. Finally, this is a grueling task that demands action about once a month. If I only had to do it once a year, that would be fine, but we wash our hands in the kitchen more than anywhere else in the house, and the tiny container doesn’t hold much soap. But now… I DON’T HAVE TO FILL MY DISPENSER ANY MORE. While inspecting a home in Minneapolis last year, I came across an unusual container for the hand soap dispenser while looking under the kitchen sink. Instead of having a tiny 8 oz container screwed to the dispenser, there was a long tube dropping down in to a huge jug of hand soap. For a split-second I figured the owner had broken their soap container, but I quickly realized that this was no accident, my friends. This was a stroke of genius. No more refilling the soap container. No more running out of soap every month. No more back-breaking acrobatics while reaching under the sink trying to unscrew the soap container. 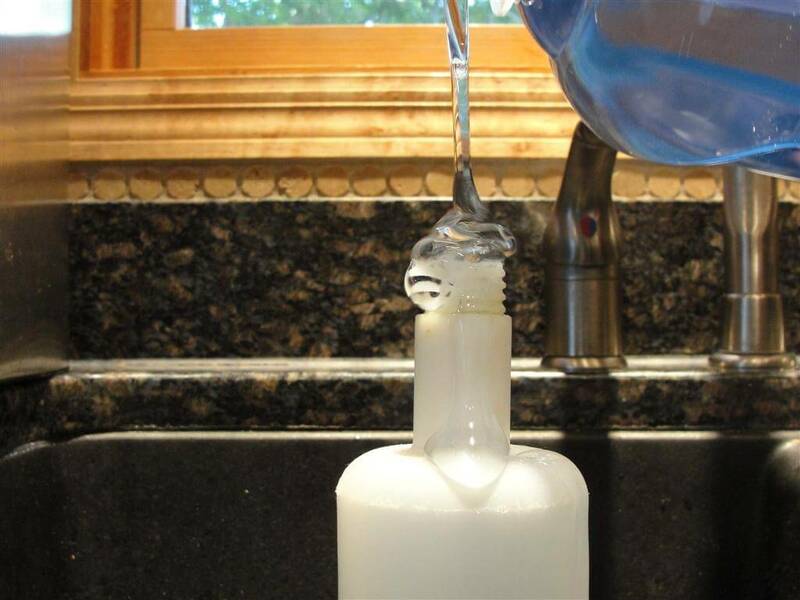 No more tears of anguish and frustration trying to pour liquid hand soap in to a 3/8″ hole. You too can do this. Just pick up three feet of 1/4″ plastic tubing, cut it to length, and replace the little plastic tube coming out of your soap dispenser with this long tube. Now drop it in to a huge container of hand soap. That’s it, that’s all. 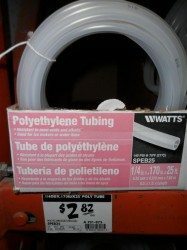 The Home Depot by my house sells a twenty-five foot roll of this plastic tubing for under three dollars. Many hardware stores sell this stuff by the foot, and you can even cut it to length with a pair of scissors. Now just sit back and marvel at your tricked-out hand soap dispenser, and decide what to do with all your extra time. Reuben is a second-generation home inspector with a passion for his work. He grew up remodeling homes and learning about carpentry since he was old enough to hold a hammer. Reuben is the owner of Structure Tech Home Inspections, where he has worked since 1997. The pipe that carries soap from the bottom to the top apparently has a “build up” and my soap won’t go down. Anyone know how to clean out that pipe? Anyone know of a kitchen sink soap dispenser that does foaming soap? Foaming soap is so much better to use. I can’t find any vendors that make one. I want to replace my old sprayer with a foaming soap dispenser. Just did it ~ and it worked! My plastic bottle broke and the top portion is now stuck in the attachment piece. After cleaning up 1/4 of soap from under the sink and after using flashlights and mirrors, I decided to google for help. THANK YOU! A few hints that may help others: take the pump with you to store ~ they are all different sizes. White tubing fit but was thicker than clear. 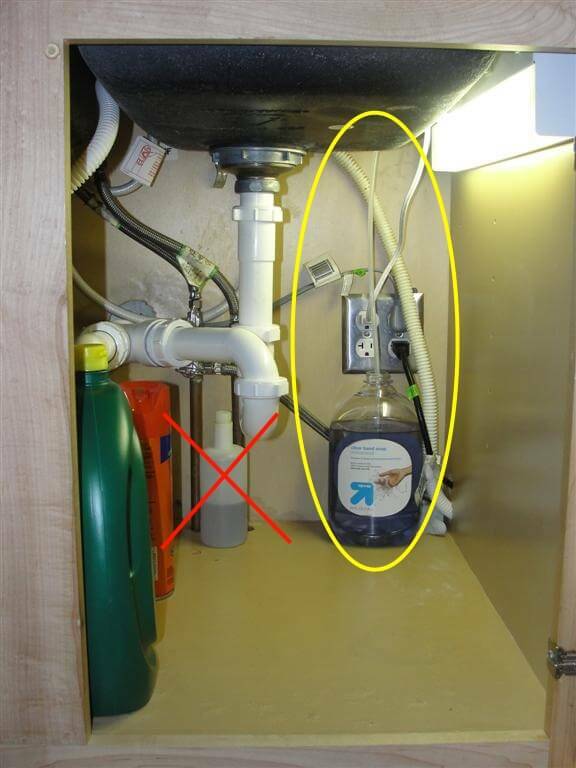 Soak tubing in warm water to loosen up a tight curl and pump water through to get air out before dropping in soap container. My dispenser is pumped and so am I! Excellent. Thanks for the great tip!! This is brilliant, an elegant answer to the soap dispenser issues I have been having. Genius. This came up first on search results and I almost didn’t click it. I am off to Home Depot right now. I had a new kitchen installed and the container has already fallen under the sink. 1 month. Geez. Why not just lift the pump out from the top ( the way the were designed ) and pour in the soap, no need to crawl under the sink, most people don know this. My soap bottle broke and I was trying to figure out what information I would need to replace it – surely it’s not as easy as one size! – and I found this. Even better! Love, love, love how smart this makes me feel! Is there anything available to cap off the soap dispenser opening since we don’t want to use the soap dispenser? What an awesome idea – I was trying to order a replacement bottle when I can across your post. Thank you for sharing – I love this kind of common sense improvement!!! Awesome! The bottle broke and I was not in the mood to replace it after seeing this. My DH was hesitant thinking we needed all these other parts. Brought home just the tubing. And while he was in the garage finding a flashlight, and tools. I already had it done. =) LOVE it when a plan comes together =) Thank You for this! Well we couldn’t get the pump to work with he long tubing so we “primed the pup like you suggested and now it leaks. Any suggestions? I don’t want o buy a new pump just to find out it will do the same thing with a long tube. Hi Kathy, I don’t have any suggestions other than buying a different pump. You very well could end up with the same issue again. Hi, I’ve tried 2 soap dispensers and I have the same problem – they leak! Hopefully you can shed some light. I tested them with their original small bottle and they did not leak. However, when I installed the long tube, the valve formed a leak! I can’t seem to figure what’s going on. Thoughts? Great! After 15 years the container that held the soap was eaten through at the threads (by the soap I guess) and I thought I’d not be able to get the threaded part out since it’s up behind the disposal. NOW I can make it functional again.Thanks!! Try depressing the plunger, plug the nozzle with your finger, let the plunger spring back up, then remove your finger. Repeat until soap comes out. I use this method to fill an old soap dispenser (using it’s own pump) with thick hair gel out of a bulk tub and it works like a charm! I did this, but I can’t get the soap up from the bottle. Is it because the line has air in it? I have been priming the pump and the soap has moved only a little, but there is a long way to go. What can I do? Hi Eva, try a different soap disposer. I’ve done this with a couple of different disposers and several types of soaps, and it usually only takes a few primes to get the soap going. How do you keep the soap from draining back into the container? In other words, do you have to keep pumping the soap through the 3 foot tube each time? Ken – I’ve done this with two different pumps, and both times the pump just kept the soap right at the top, ready to use on the first pump. I worked in a school lunchroom for many years. We had one of these connected to a five gallon bucket of dish washing liquid. Hey Reuben; although my dispenser filled easily from the top, it was still a pain in the posterior. I too sought the same solution as you did. (You’d think the industry would have thought of it by now) I lucked out and found surgical tubing the right size. It grips better and conforms to corners better too. I’ve been using this arrangement for about four years now. Works great and I can’t remember when I last had to fill the gallon jug of anti-bacterial soap. Best…….. I just did this and it WORKED PERFECTLY. Highly recommended. Our giant soap bottle had a snap cap. The hole in that cap was already 1/4″ so we could slide the tube directly into the hole making a leak-proof seal! Great work Reuben! OMG! Geeeeeenius! I saw a pump for sale at HD that allowed this and have been debating on buying it. Why? I’m cheap, it was $20 and had an ugly pump attached. And I didn’t feel like maneuvering under my cramped sink. Had NO idea I could McGyver this thing on my own but now that I see your post, duh! Many thanks your way. Btw, this is the phrase I googled that led me to your awesomeness: kitchen sink soap dispenser tube. I was trying to see what it was called so I could amazon it. Ha. Oh, this site is a God send. I just had counter tops installed and guess what, the soap dispenser and the garbage disposal is on the same side. When I was told that the cable for the disposal was in the way I was so upset. I am not going to go thru a long story but THANK YOU so much for your idea I am so HAPPY. Great tip Reuben! I have to say the “Costco” sized hand soap pictured is actually the Target brand hand soap. Sorry couldn’t resist commenting as I work there! Thanks again. Ben – life doesn’t have to be so hard. I installed one of these 2 years ago, and it has been empty now for about 20 months. This looks way easier then attempting Cirque du Soleil moves under my counter. Thanks Jim, and best of luck to you in the blog contest. Oh yeah, That is sweet! Thank for sharing!